With short travel distances, superb fishing waters and low population, Southern Sweden is seemingly made for sport fishing. Its waters are rich, including such species as pike, perch and zander, as well as other sport fishes like tench, bream and roach. 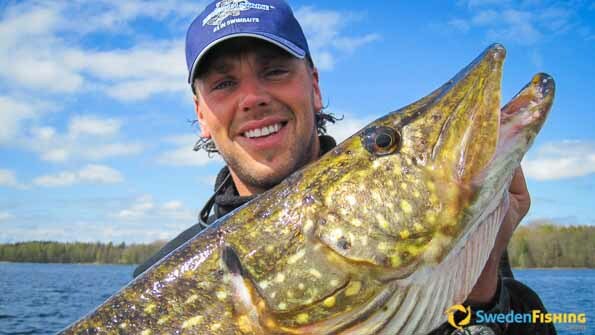 The wide choice of fishing destinations, with ferry lines and the Öresund Bridge make it easy to plan a fishing trip to Sweden. 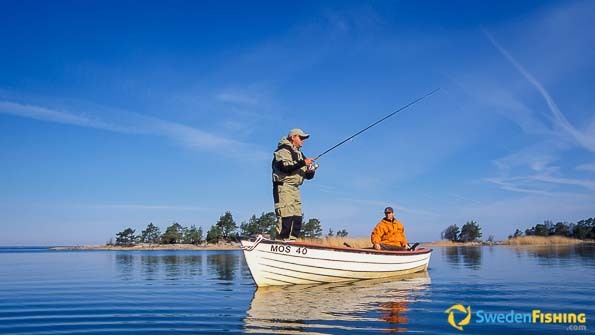 Southern Sweden offers countless opportunities to the sport fisherman being rich in lakes, running waters, a long, lovely coastline and the sea itself beyond. 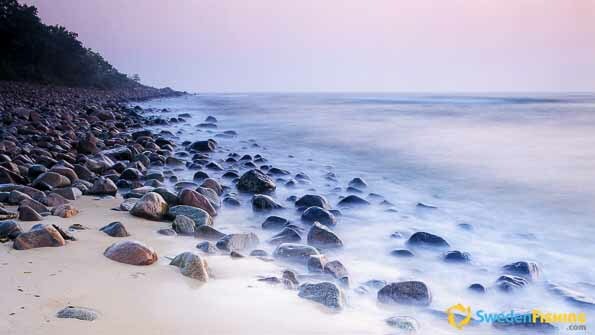 It is an immense expanse stretching from the northern coast of Bohuslän province through the Kattegat Sea to the Baltic Sea and the northward past Gotland Island. “However you want to fish and whatever you want to land, whether you’re an experienced fisherman or newcomer, there’s something here for you,” says Sven, himself a frequent angler in southern Sweden. Fly-fishing brown trout on a calm lake somewhere in southern Sweden. Without a question, it is pike most anglers seek, more even than perch. In most waters in southern Sweden zander is also on the list. Along the coastline west, south and east both sea trout and salmon are spring and autumn favourites. There are excellent opportunities for rod fishing after such species as tench, roach, silver bream, common bream, carp, ide, common rudd, vimba and blue bream. Specimen anglers will find any number of untried waters to explore here. In the truly large lakes there are many superb places for landing pike. Still it is trolling fishing for salmon or really large brown trout that is the primary lure for sports anglers from both Sweden and abroad. Not forgetting that both lakes are home to what may be the world’s largest lake trout in what is called the Gullspång trout. Fishing for salmon along the southern and eastern coastlines of Skåne province is also well developed in places like Simrishamn and the Hanöbukten Bay. Rivers, such as Mörrumsån, Emån and Ätran, all offer summer season salmon fishing using both spin and fly, boasting well functioning service for the sport. Sports fishing is free of charge along the coasts, but new rules limit you to three pike per day in the 40 to 75 cm range. Fishing in lakes and running waters inland requires a fishing licence for the specific waters to be used. However, in the five largest lakes (Vänern, Vättern, Mälaren, Hjälmaren and Storsjön) fishing with hand equipment is unlicensed, allowing everyone to use sports fishing methods. As pike will swim in shallow waters in both spring and autumn, it is possible to catch really large ones with light equipment. Though perch is often found in the same waters as pike, they are usually fished with different lures and methods. Though a popular sports fish, zander is not as common as the other two species. In the clean waters of Sweden, zander is much sought for food. Sven agrees and adds ”that inland there are a number of running waters with excellent trout populations. Here fly fishing is the dominating method.” Another common form of fishing waters in this area is lakes stocked with rainbow and brown trout. Though requiring a fishing card, the catches can be very good and the average weight is frequently higher than in comparable natural waters. Popular here are the Harasjömåla, Tiveden and Hökensås areas. The lakes at Hökensås fishing area contains both rainbow trout and brown trout. The fishing season in southern Sweden is normally very long. It is only during a few winter months that pike fishing is stopped, mainly by frozen water. Best for the real giants is spring and early summer (March-June) and the end of October into November. The number of pike is highest during high summer from July through September, but you cannot be sure to catch the big ones over 100 cm. Trout, zander and various whitefish is best from May through September, while trolling for salmon is best in late autumn and early spring when the water temperature is low. The same is true for sea trout along the coast. Top season in running water is from mid-May and onwards.